Spain’s Pablo Larrazabal held off Rory McIlroy and Phil Mickelson to win the Abu Dhabi HSBC Golf Championship at the Abu Dhabi Golf Club by a single shot. Larrazabal fired a closing round of 67 to end the week one clear of McIlroy and Mickelson and claim his third European Tour title, his first since 2011. The Spaniard began the final round three shots behind Craig Lee. 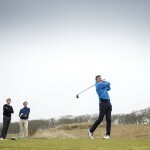 But the Scot stumbled early in his round with bogeys at the fourth and fifth holes, throwing the tournament wide open. Lee eventually closed with a disappointing 77 to end the week in a tie for 10th place. Larrazabal was one of a number of players in contention through the front nine, before 2013 Open champion Phil Mickelson took to the front with three birdies in his first 10 holes. But Mickelson came unstuck at the 13th when he attempted to play back-handed from under a bush. He caught the ball twice with that stroke then required a penalty drop. In the end he walked off the hole with a triple-bogey seven. Larrazabal took advantage of Mickelson’s slip and closed with a birdie four to set a clubhouse total of 14-under-par. The American fought back valiantly and gave himself a chance to tie Larrazabal with an eagle at the 72nd hole. He found the par-5 green in two but was unable to convert the eagle putt and finished one shot back. Rory McIlroy also came up just shy and was left to consider what might have been, after a string of missed birdie efforts. The European Tour stays in the Middle East for the next two weeks with the Qatar Masters then the Dubai Desert Classic.